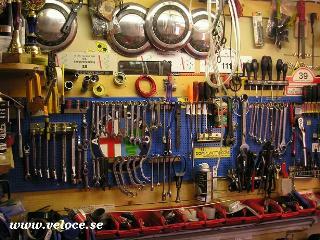 Have fun in the garage, your Alfa will feel much better too. It is important to know what you want to do and why. Sometimes the problem is not what you think it is. I have learned this the hard way when my oil pressure was a little too low on my Giulia Super. New bearings all over but the pressure was still too low. (Censored #&&##_&%_#). It was the indicator on the engine block that was incorrect, not the bearings. Anyway, after this operation in 1969 I am more careful. n 1980! I made a complete overhaul on my 1750 Roundtail Spider incl. valves, piston rings, bearings, carb rubbers etc. etc. and new cam chains. The next summer, I only use my Spider in the summertime, a most annoying razzling occurred sometimes. I rechecked the valve clearance, cam chain etc., the ignition, was correct. Still that noise. Next summer, same thing and another rechecking and adjusting. Still the same. To make a long story short, I used the Roundtail almost every summer but that #¤%¤#¤ engine noise was still there. Alfa friends listened but nobody could trace that razzling. 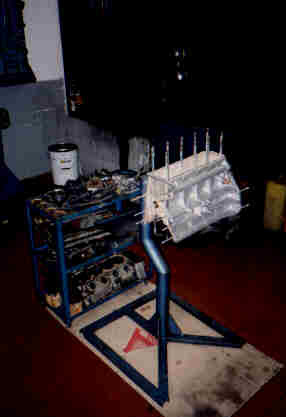 In 1996 I made another complete overhaul on my engine, new pistons, liners, bearings, valves (3 new), new valve guides and seals and an electronic ignition system (Marelli from a FIAT 132), new carb rubbers etc. The engine did not sound like before, it was now running more quiet but sometimes that #¤#% started at 2.500 - 3.000 revs. Suddenly we came out from the forest on a public road and I accelerated. Boom! It was like something hit the engine like a machine gun. I stopped instantly and turned the engine off. Then I saw the front crankshaft pulley spinning in front of me like a Frisbee out in the field. I opened the bonnet and found that the fan was completely demolished but the radiator was OK, otherwise no damages. My beloved wife found the pulley after 15 minutes while I was phoning for assistance. One of my brother in laws came with his Citroen XM and he towed us to the Alfa garage in Lund, some 30 minutes drive. One thing although, don't be afraid to temper with your Alfas, they like it, and it's very fun too! For instance, taking the head off is a minor operation. This is how I use to do it. A blown head gasket is easy to replace, just follow my steps. Once, the head is removed, take the opportunity to check the valves. If your Alfa is consuming too much oil, the answer might be found here. Talking about oil, if the valves and guides seem to be OK, perhaps the piston rings need to be changed. Again, no fuss, you can easily do it with the engine in the bay. It is a minor operation. I have done it several times, and it's even fun to do it. With the pistons off, have a look at the liners since they are quite easy to remove. The heating system and the radiator are also easy to overhaul. The Webers are the heart of your engine so adjust them carefully.